San Francisco, 1915. As America teeters on the brink of world war, Charmian and her husband, famed novelist Jack London, wrestle with genius and desire, politics and marital competitiveness. Charmian longs to be viewed as an equal partner who put her own career on hold to support her husband, but Jack doesn’t see it that way…until Charmian is pulled from the audience during a magic show by escape artist Harry Houdini, a man enmeshed in his own complicated marriage. Suddenly, charmed by the attention Houdini pays her and entranced by his sexual magnetism, Charmian’s eyes open to a world of possibilities that could be her escape. As Charmian grapples with her urge to explore the forbidden, Jack’s increasingly reckless behavior threatens her dedication. Now torn between two of history’s most mysterious and charismatic figures, she must find the courage to forge her own path, even as she fears the loss of everything she holds dear. 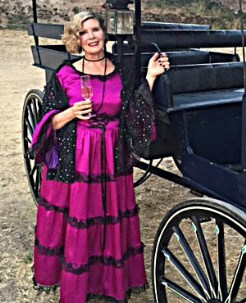 A California native, Rebecca Rosenberg lives on a lavender farm with her family in Sonoma, the Valley of the Moon, where Jack London wrote from his Beauty Ranch. Rebecca is a long-time student of Jack London’s works and an avid fan of his daring wife, Charmian London. 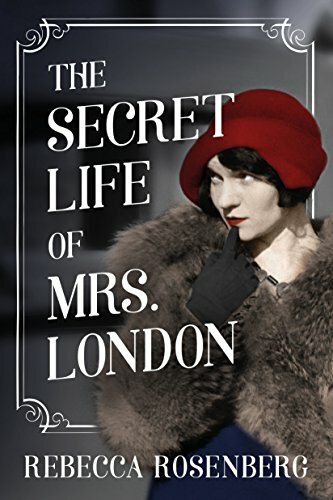 The Secret Life of Mrs. London is her debut novel. Rebecca and her husband, Gary, own the largest lavender product company in America, selling to 4000 resorts, spas and gift stores. The Rosenbergs believe in giving back to the Sonoma Community, supporting many causes through financial donations and board positions, including Worth Our Weight, an educational culinary program for at-risk children, YWCA shelter for abused women, Luther Burbank Performing Arts Center to provide performances for children, Sonoma Food Bank, Sonoma Boys and Girls Club, and the Valley of the Moon Children's Home. For more information, please visit Rebecca's website and blog. You can also find her on Facebook and Goodreads. Visit the Facebook page for The Secret Life of Mrs. London. The Secret Life of Mrs. London is a fabulous read and lingered long after I closed the back cover. From the opening scenes of Charmian and Jack sparring in the boxing ring, it keeps me turning the pages. From intriguing political debates, to their writing life, Jack and Charmian London’s friendship with Harry Houdini and his wife, Bess, plus their love triangle is told through a lot of delicious details. Even though I am a long-time admirer of Jack London’s work, I haven’t read anything before about Jack or his wife, Charmian. And as the title of the novel suggests, the character I am most interested in is Charmian. Her education, spirit, and literary pursuits in the early 1900’s must have seemed daunting. Inspiring. Both Jack and Charmain are big personalities and colorful people full of as much magic as a Houdini act. But this is the heart of their conflicts too. Charmian’s tale weaves it’s way around and beside Jack’s, and Charmian does achieve success as a writer of her own material. Some of that success she achieves is in the later part of the story, and who better than Charmian to put on the boxing gloves again, so to speak, and fight for the right to write the biography of Jack. Some of the delicious details are related to food and this is no surprise because Rebecca also is the director of Worth Our Weight, an educational culinary program for at risk children, in California. Please visit the C'est si Bon! Cooking School's website for Hawaiian Sweet Potato and Papaya Salad, a recipe reminiscent of the London's time spent in Hawaii. Here’s a description of Thanksgiving at Jack and Charmian’s Beauty Ranch. Thanks for your review. I'm really looking forward to reading it. We offer you all world famous replica watches uk, with same appearance, same quality and same material…you cannot tell which one is a replica rolex just with your eyes at all!